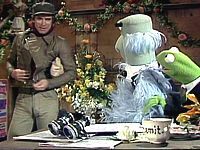 This is one of the few Muppet Shows that start with backstage action after the opening theme before Kermit makes his onstage introduction. (This had been done only once before in last year's Valerie Harper episode.) 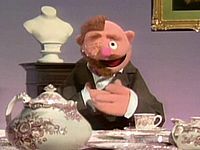 The idea of The Muppets needing to "class up the place" before the show starts because of its guest star is echoed in next season's Liberace episode. This show also breaks with the tradition established this year of showing the guest in the cold opening. Since it was a major coup to get Nureyev to guest on the show, the writers may have wanted to tease the audience a little into seeing if Rudolf would actually be the guest or if it was a gag. Although it was a lot easier to get guests on the program during its second year after the show became a hit, Nureyev's appearance is credited as being the major door-opener to book future guests. The giant pig is performed by Royal Ballet soloist Graham Fletcher, who would continue to be called upon for various costumed dance numbers for the show. One such costumed character, Fletcher Bird is named after him next year. 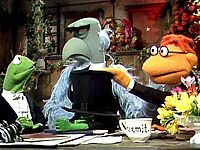 Probably one of the biggest Muppet debates comes from this episode. The giant pig that dances with Rudolf Nureyev is often cited by fans, newspaper and magazine articles, game shows, and sometimes even Henson Co. material as being Miss Piggy herself. The design is quite Piggy-esque, but more like a parody of the superstar as opposed to a realistic interpretation with dainty first-season-like nose and large eyes (all the elements that had been changed for this year being exaggerated in the costume puppet). The show probably wanted to keep it ambiguous so they could have it both ways...the idea of Piggy dancing with Nureyev is good publicity and press fodder - but once one tunes in, it's doubtful that the pig could be construed as Miss Piggy. For one thing the pig is never referenced as being Miss Piggy (or not). Second, Miss Piggy's reaction to doing a musical duet with Nureyev seems contradictory had she been doing the ballet with Rudolf earlier. The final clue that the giant pig is not supposed to be Miss Piggy is in its design - while it appears to be "inspired by" Miss Piggy, there's little doubt the Muppet builders could have done a better job realizing her if it was supposed to be our favorite diva...perhaps the biggest giveaway that it's not supposed to be Miss Piggy lies in the fact that the giant pig has eyebrows. The giant pig would later reappear in the Cloris Leachman episode (posing as Sweetums when the pigs take over the show), further evidencing that the giant pig is a different character than Miss Piggy. A special screening of this episode was provided at a New Year's Eve party at Ann-Margret and Roger Smith's home. Brian Henson: "Hi, I'm Brian Henson. This episode of The Muppet Show stars Rudolf Nureyev. 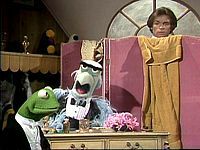 Nureyev is one of the 20th century's greatest ballet dancers, perhaps the last person you'd expect to find on The Muppet Show. They contacted Nureyev to find out what he wanted to do with The Muppets and he said I'd love to dance with Miss Piggy. Well of course with Miss Piggy it's kind of hard to do a ballet sequence because she's generally only seen from the waist up. So what they did was, they built this crazy, big, kind of goofy pig costume to dance with Nureyev. The dance floor was a little slick and Nureyev actually taught us a little trick. He says you mop the floor with Coca-Cola. 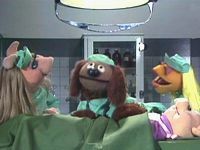 So if you watch this episode check out the sticky floors and the extra large pig on The Muppet Show." Scooter, dressed in tux, discovers an empty guest star dressing room and reasons Nureyev was too smart to show up. The balcony: Statler and Waldorf sing along with the music. Gonzo's horn: A long green balloon comes out of Gonzo's trumpet which Gonzo taps with his nose..
KERMIT (waving arms): Thank you thank you thank you! Hi there and welcome to The Muppet Show! SAM: You call THAT dignity? OPENING NUMBER - "MINUET IN G MAJOR"
The band actually starts off playing a classy rendition despite their unconventional instruments, attire, and audible grumbling. DR. TEETH: Hey what's this bummer called again? FLOYD: Minuet in G Major. DR. TEETH: I'd like to send it back to the minors. 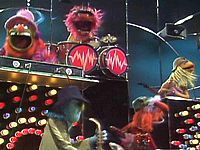 Animal is unable to confine himself to the more legato tempo and bursts into a rock beat as the rest of the band follow. STATLER: You know the older I get the more I appreciate good music. WALDORF: Yeah? What's that got to do with what we just heard? STATLER: Nothing. Just thought I'd mention it. Sam is infuriated at the thought of what Rudolf Nureyev must have thought about the opening number. KERMIT: ...He is not here! With their guest gone, Kermit brings on the love opera from the third act of Barber of Die Fliedremaus. Link and Miss Piggy are decked out in full opera garb but end up upstaging and all out fighting with each other with their props. Sam eventually has to break up the onstage shenanigans by lowering a giant magnet on the set! STATLER: You know, there's nothing like grand opera. WALDORF: Yep, and that was nothing like it. Kermit assures Sam that Rudolf's not mad and is presently changing into his costume for his big ballet number...Swine Lake. Rudolf's grand interpretation of Swan Lake complete with impressive royal set is soon interrupted by a huge full-size pig that's intent on hogging the spotlight...soon classic ballet starts resembling Rita Moreno's slapstick cafe dance! UK SKIT: MUSICAL NUMBER - "SOMETHING'S MISSING"
A Whatnot with one eye and half a beard/moustache, hair, and glasses sings among an incomplete set (including a faceless Mona Lisa) about how his life is not fulfilled - until he meets up with his love. The cast performs its tribute to Shakespeare. NURSE PIGGY: Look at the time! DR. BOB: Hey - the timing of the shrew! NURSE PIGGY: Are you calling me a shrew? DR. BOB: If the shrew fits! STATLER: Now that really offended me! I'm a student of Shakespeare. WALDORF: Hah - you were a student WITH Shakespeare! 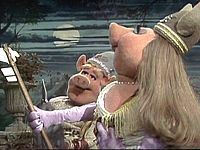 Miss Piggy's thrill over her love duet with Kermit turns into outright elation when she learns she'll be doing it with Rudolf Nureyev, trampling the frog as she rushes onstage. MUSICAL NUMBER - "BABY, IT'S COLD OUTSIDE"
Miss Piggy's joy continues as she catches sight of Rudolf dressed only in towel as their number takes place in a steam room. PIGGY: Don't you talk to strangers? RUDOLF: Depends on how strange the stranger is! After engaging in some banter and a duet, Piggy finally smothers Rudolf with kisses as Nureyev makes a quick escape - with Piggy left clutching his towel! STATLER: Boy he's really good that Rudolf Nurey...uh...N-Nureyi...you know I should really learn to pronounce his name! WALDORF: Don't bother now - after this show he'll probably change it! 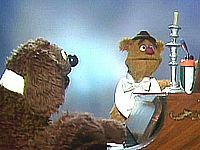 ROWLF'S PIANO - RECITAL OF DEBUSSY'S "CLAIR DE LUNE"
Sam enters to apologize for the stuff Rudolf's had to do on the show only to find that it's all stuff Nureyev wanted to do...and then to add insult to injury, the ballet great is dressed up for a tap number! CLOSING NUMBER - "TOP HAT, WHITE TIE AND TAILS"
Rudolf starts the number for Sam then makes his way backstage onto the stage where he's joined by Muppet chorus line (including Mahna Mahna!) all in top hats and tuxes. SAM: Mr. Nureyev, I just want you to know that I am sorry. RUDOLF: You are sorry you threw me out? SAM: No, I'm sorry I ever let you back in! STATLER: Now wasn't that a cultural show?